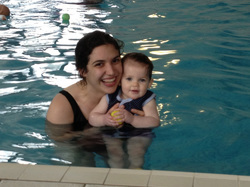 Amelia and I have been going to swimming lessons with Geraldine and Julie since she was seven months old. We moved from the baby class to the toddler class when she was thirteen months old. I love the confidence that Amelia shows already in the water. She knows that she is safe and, if there's anything she is uncomfortable with, we don't have to do it. One of the main principles that we are reminded of each time is to gain their trust with eye contact, and only to put them under the water when they are ready. As a result, Amelia almost never cried, except when she has been unwell or it's cold! She swims to me from Geraldine, both over and under the water. She kicks her legs happily while hunting for little ducks and is learning to scoop her hands. They learn how to sit safely on the side before getting in, and how to go to the side and cling on if they need to. One of Amelia's favourite things to do is to jump in from the side as we sing Humpty Dumpty. The lessons are light hearted, personal and full of singing, laughing and cuddles. We sing different nursery rhymes, always starting and ending with the same ones so they know when it's time to get out. The groups are nice and small so Geraldine has time to come and talk to each mum (or dad) in turn. We do some things as a whole group but have some time to swim around with our babies ourselves. I am so pleased we found these classes. 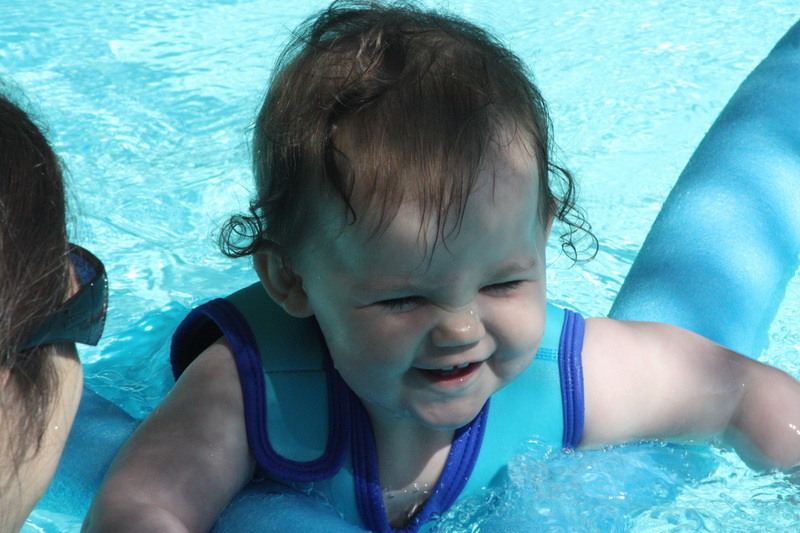 I know that Amelia is getting a great start for swimming, and she absolutely loves water now, wherever she can find it! 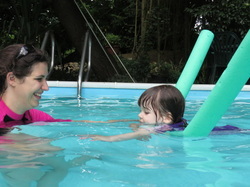 ​Experience the joy of swimming with your baby! 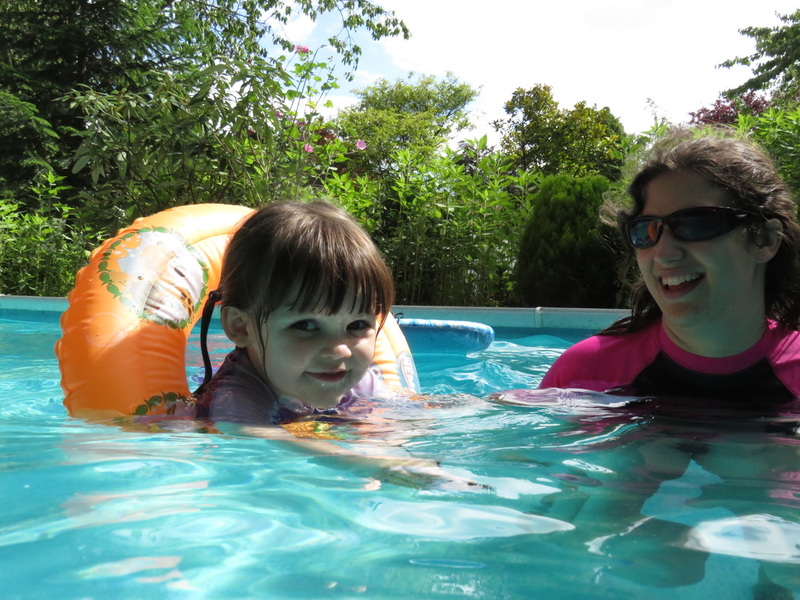 Teaching your child to swim is one of life’s true pleasures! 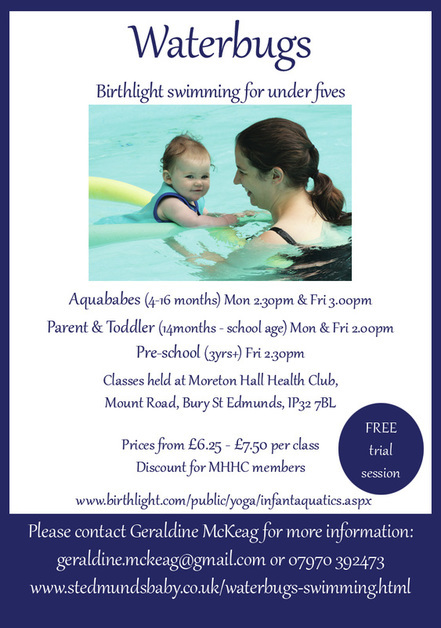 Waterbugs is a small and independent swim school, run by two enthusiastic experienced swimming teachers using Birthlight’s gentle progressive approach to baby and toddler swimming. This special half hour each week gives you and your child the opportunity to spend some real quality time together without the interruptions of our modern hectic life with the added bonus of teaching an essential life skill. Water parenting is promoted through love and joy in the water. As you and your child grow in confidence above and below the water, the pleasure of water play is unleashed! 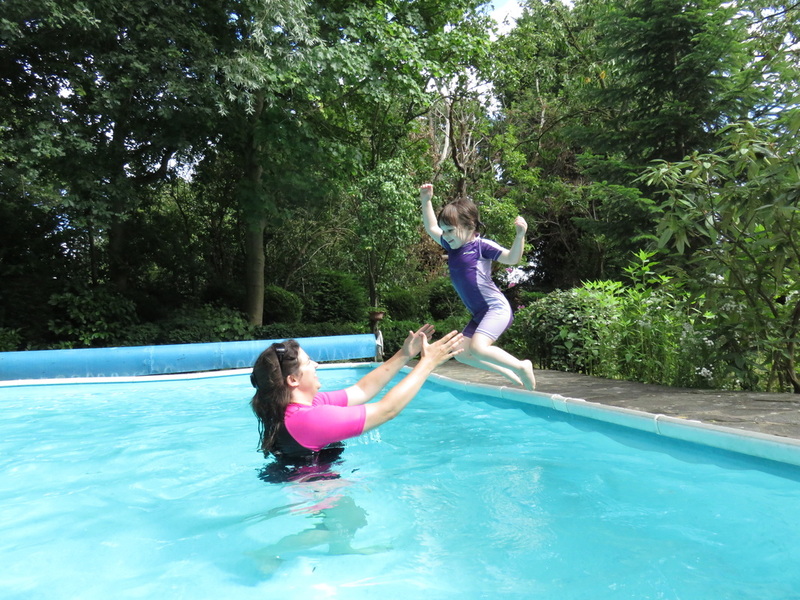 The methods utilise the baby’s natural reflexes to develop balance, rolling, kicking, holding on and swimming! In the Aqua babes classes (4 months to 18 months) you are taught safe holds, floating and swimming with your baby and progression to independent propulsion, along with a gentle and progressive approach to submersion. 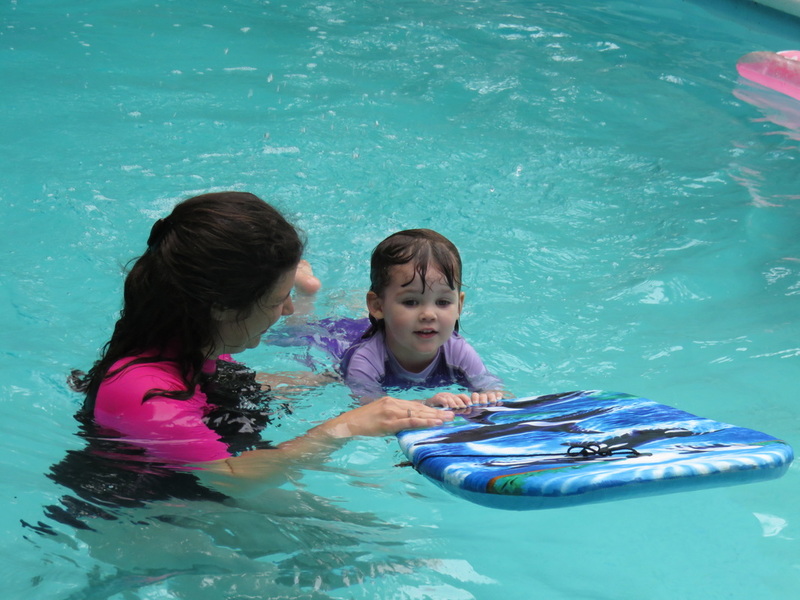 Water safety is developed from your first lessons as babies begin to learn to climb in and out of the water. This progresses to learning to swim back to the side after jumping in. This safety ethos is continued through the toddler classes so children learn to respect the water environment and be safe! The Parent and Toddler classes (18 months to school age) follow a routine so the children have a structure that feels familiar, starting and finishing with a song. Fun and enjoyment is the most important thing for the children and their adult. Whilst enjoying the water, swimming skills will be acquired. In the lessons we use woggles (floatation aids) to promote independence in the water and begin to teach basic strokes and techniques to promote independent swimming. Classes have a maximum of 10 adult and child pairs and there are always two swimming teachers on hand to help support and give advice. Two adults can accompany each child and this is actively encouraged at no extra cost. Your first lesson is a free trial, and classes are charged at the beginning of each half term. We operate during school term times.